What’s next for fashion flash-sale sites? The emergence of members-only, online flash-sale discounters in the early 2000’s leveraged the traditional need for luxury and premium brands to discretely dispose of excess stock, by capitalising on the opportunities presented by a fledgling e-commerce landscape. The business model was based on a simple proposition: to make high-end goods available at rock-bottom prices online, in an innovative digital declension of the traditional designer end-of-season sample sale. Sale events, characterised by a short duration (typically, under 72 hours) and deep discounts (up to 70-80% off retail prices) and targeting a gated, members-only community, replicated the exclusivity and sense of urgency of traditional sample sales while allowing discounters to scale up to achieve considerable volume. 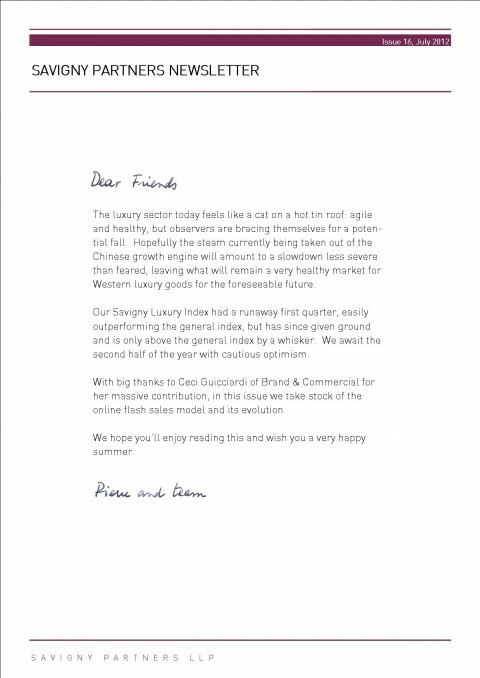 The 2008 financial sector crisis brewed the right conditions for online discounters to really thrive, as the sharp decline in consumer confidence caused by the banking crisis meant that luxury and premium brands found themselves with considerable product surplus and unable to shift inventory. Flash-sale sites were uniquely positioned to help brands out of these dire straits, enabling brands to liquidate stock quickly and discretely – the latter a particular plus for luxury brands wishing to avoid tarnishing their brand equity. The business model that was introduced by Vente-Privée, the French company widely regarded to be pioneer in the sector launching back in 2001, required little working capital on the basis that stock purchase did not occur until the wrap-up of the sale event and only after receiving payment from final customers. This meant generating positive cash flow and achieving almost zero inventory risk. Following the rapid growth of Vente-Privée (the company reached $1 billion turnover in only 6 years), numerous players entered this space, keen to reap the unique opportunities presented by this model during this economic climate. All across the globe a large number of thriving, localised players emerged, ready to target their offer to local demographics. Between 2007-2009 inEurope, new entrants appeared including Buy VIP, Cocosa, Brand Alley and Brands4Friends. Meanwhile, in theUS, Gilt Groupe, Hautelook, Ideeli and Rue La La moved in, quickly establishing themselves as volume players in this key market. In most cases, while sites started out by concentrating on selling ready-to-wear and accessories, in time they expanded by gradually introducing new verticals such as homeware, sports equipment, technology, toys and wine. Traditional e-commerce and brick-and-mortar players also soon stepped into the flash-sale segment. In September 2010 Amazon bought into the Madrid-based Buy VIP, while online auctioneer eBay moved into the sector with a stake in the German Brands4Friends and shortly thereafter in early 2011 acquired Rue La La through its purchase of the parent company GSI Commerce. In 2011 Nordstrom acquired Hautelook for $270 million, while the same year erstwhile department store owner Mohammed al-Fayed purchased London-based Cocosa through the al-Fayed family trust for an undisclosed sum. …But is the model still relevant? While the recession certainly whetted consumer appetite for a good bargain, the competitive landscape quickly started looking more and more saturated, resulting first and foremost in downward pressure on existing discounters to secure true luxury designer merchandise. At the same time luxury brands, cautioned by the recession from being caught unawares with over-stocked warehouses, began to adopt a leaner approach. Soon, there was simply less distressed luxury product to go around and, as a result, many players have had to dramatically rethink both their format and their offer in order to survive. To a large extent, the shift from a luxury to a premium product, or the expansion from fashion to lifestyle offer, was inevitable; ultimately, the flash-sale model was designed to move volumes that the luxury fashion sector alone cannot supply. Indeed, UK-based Brand Alley is one such player that has recast its offer to exclusively premium and high-street brands that better cater to the volumes required. Meanwhile, 30-40% of Gilt Groupe’s womenswear offer now consists of non-distressed merchandise which is produced exclusively for the site, a move that ultimately undermines the discounter’s unique selling proposition as a curated and high-end flash-sale purveyor. Part of the problem for flash-sale sites is that as the business grows, companies are faced with a high customer acquisition cost that only increases as more users join the platform and the overall market becomes more and more saturated. For those players that have chosen to retain the members-only gated access, this challenge is ever more acute. Ultimately, being market leader is the only way to assure organic customer acquisition and this has resulted in a number of high-profile strategic acquisitions and investments taking place within the flash-sale segment. To date Gilt Groupe, the biggestUSplayer, has raised $240 million in investment, led chiefly by Matrix Partners, General Atlantic and Softbank Group, with the most recent valuation placing the company at roughly $1 billion. Since its founding in 2007, Gilt has gone on to launch a number of new verticals and establish Gilt GroupeJapan, Gilt Cities (a localised, daily-deal site) as well as Park & Bond. Interestingly in October 2010 it acquired San Francisco-based Bergine, and only last November it acquired BuyWithMe, decisions which Ryan acknowledged as largely motivated by the desire to acquire the daily-deal sites’ considerable databases, which Gilt could leverage across its verticals, but in particular with Gilt Cities. Interestingly, Cities places Gilt in direct competition with flash-sale coupon giant Groupon. It is worth noting that Groupon has been engaged in an aggressive (and expensive) customer acquisition campaign – including three strategic corporate acquisitions within the month of February alone – at the expense of developing customer loyalty. This underlines a key point about customer acquisition, that it that it requires a parallell customer retention strategy, particularly when conversion rates in the sector are still relatively low (8-10%). Meanwhile Vente-Privée, having originally established a strong, localised presence across Europe thanks to an early €160 million investment by Summit Partners in 2007 (who acquired a 20% stake in the business at a time when revenue was €240 million and equity valued at €800 million), unveiled Vente-Privée USA as a joint venture with American Express, in a move widely construed as a bid to directly take on Gilt Groupe. Indeed, the future of luxury flash-sale sites may well be in adapting the model into new directions. Launched in 2011, Moda Operandi provides an excellent example of a flash-sale site that has emerged with a strong point of difference and which holds considerable potential. Like other flash-sale models, Moda Operandi offers limited time sales. However, unlike Gilt and their ilk, Moda flips the premise of past-season discounting and instead offers its customers access to pre-season, luxury fashion, allowing the site to cater to a sophisticated, fashion-forward consumer. This model is a lot more brand-friendly as not only does it offer instant cash-flow (from the 50% down payment that customers place to secure their orders), it also helps increase efficiency by contributing to better product forecasting and minimising inventory risk and, crucially, avoids the dreaded discount word. Moda Operandi announced at the beginning of June 2012 that it had raised a further $36 million from venture capital firm RRE Ventures as well as several high-profile strategic investors, including IMG, Condé Nast and LVMH-Moët Hennessy Louis Vuitton, indicating strong industry and market support. 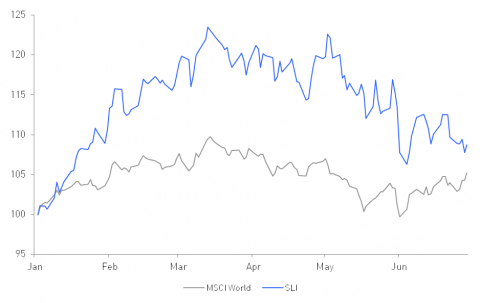 The Savigny Luxury Index (“SLI”) gained a net 8.7% in the first half of the year, outperforming the benchmark MSCI World Index (“MSCI”) by 3.5 percentage points. Nevertheless it endured a much bumpier ride than the MSCI, at first enjoying a bull run, gaining nearly 24% in the period up to 13 March, only to fall by 12% in the three following months. The sector continued to impress with strong results but worries overChina’s faltering growth along with the never-ending woes of the European debt crisis caused the sector to lose its sparkle for investors. The year started off on a high, with yet another string of exceptional year-end results for the luxury goods sector, seeing sales and profit growth well into double digits. Worries over the sector’s outlook that had dogged the SLI in the second half of 2011 were left behind and the SLI shot up past its 2011 peak within the space of one month. It continued its near-vertical ascent in February and March as sector players confirmed robust trading conditions. 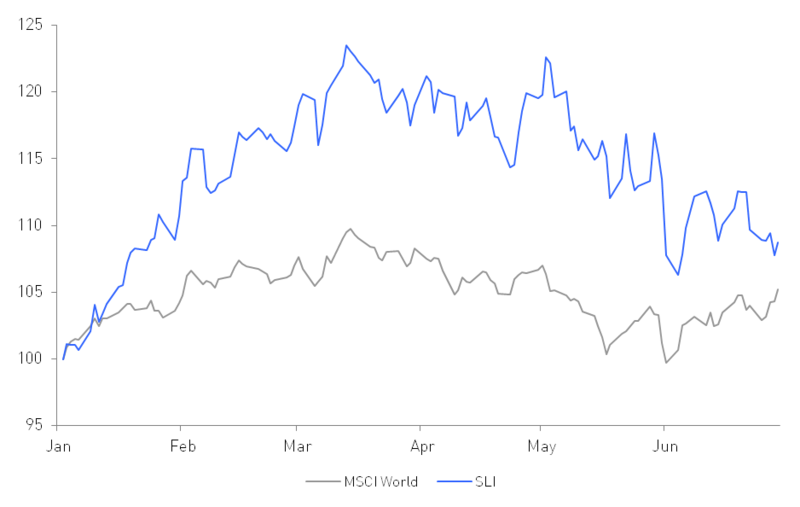 The SLI climbed an impressive 23.5% to its peak in mid-March, relative to a gain of 9.5% for the MSCI. By the time March came around there were more and more signs that the Chinese growth engine was shifting down a gear. The Chinese Premier Win Jiabao announced at the beginning of March that the country’s growth target was cut to 7.5% for 2012, the lowest level in decades. Although partially offset by the expectation of lower import duties, this announcement and ensuing news that output from China’s factories was slowing sent shudders down the SLI’s spine. To add insult to injury, by April the European debt crisis had morphed from a Greek tragedy into a full-blown soap opera involvingItaly,Spainand potential appearances byPortugalandFrance. The SLI began its first slide, losing 7.4% of its value from mid-March to mid-April. Strong first quarter results for PPR and LVMH, along with robust Swiss watch export data and a successful IPO for Brunello Cucinelli provided momentary respite for the SLI, which climbed 7.1% in the last week of April. However, signs of weaker trading conditions in theUSAandEuropewere beginning to emerge and many players began warning that 2012 would be a difficult year. Despite further strong results announcements by the likes of Richemont, Burberry, Ferragamo and Ralph Lauren, the tide of market sentiment had turned against the sector. May was the first month in which all of the constituents of the SLI fell into negative share price growth territory. This downward trend continued in June, despite some glimmers of hope that the European debt crisis may come to some form of resolution, if not containment. The outlook for luxury goods sales in 2012 is still positive, albeit in single digits only according to studies published by Bain and Altagamma. For our part, we believe that the big groups will continue to enjoy near oligopoly status inChinaand will see double digit growth as a result. Europe, now fundamentally sick, has long been the bedrock of luxury goods andChinais now its main client. How these two economic juggernauts evolve will dictate the health of the luxury goods sector over the next few months.